Once again, more than 3200 passionate developers gathered for one week in Metropolis, Antwerp. The Devoxx event is split in two parts: the “University Days” on Monday and Tuesday (long conferences, tools, trainings and hands-on labs), and the “Conference Days” from Wednesday till Friday noon (keynotes, conferences, quickies and “BOFs” (round tables)). What is unique in Devoxx, is that it is made by and for the developers (the real ones: those that are actually writing code!). You will see almost no commercial presentation there. On the contrary, speakers don't hesitate to display code, or even to write it live! You come back from Devoxx with tons of practical information and lots "things to try at home by myself". It's also giant live Twitter walls all over the venue; 29 companies presenting their products and distributing their goodies at heir booth; 59 JUGs (Java User Groups), many whiteboards, and hundred of places to sit and start coding. There is of course free WiFi, with this year a 1Gb/s internet pipe! Enough to give easy access to any participants (easy, except maybe for the few unlucky ones that are still using Windows instead of OSX ;-)). Wednesday was the day of free French fries, Thursday of free movie ("Tintin" this year). There was also free beer and after parties every night... and countless occasions to meet members of the Java community, from all over the world. Devoxx is the place where any lambda developer can talk with the Chief Architect for Java at Oracle, for example. To celebrate the 10th anniversary of Devoxx, each participant received a nice free mug (I chosen the HTML5 collector! ), and was invited to a memorable free clubbing party at the Noxx. This year, Devoxx was 167 speakers giving about 174 sessions happening in 7 theatre rooms in parallel: 3 Keynotes, 1 discussion panel, 86 Conferences, 16 University, 10 Labs, 19 “Tools in Action”, 14 Quickies, and 25 “BOFs” (informal discussions)! These sessions cover 9 tracks: Java SE, Java EE, Web, Mobile, New Languages on the JVM, Methodology, Architecture, Security, and "Partner slots". There were up to 8 talks running in parallel. Devoxx is initially focused on the Java ecosystem, i.e. not only the Java language, but also other languages based on the Java Virtual Machine, and all Java related frameworks in general. Also, more and more pure Web and mobile technologies are gaining importance in this conference. This year, HTML5 and Android talks were amongst the more attended ones (btw, let's highlight here the big presence of Google at this conference, and the quality of speakers they sent). Beside these, there are also a number of talks about the job of developer (or, should we say about the software craftsmanship). As usual, one of the big theme was the evolution of the Java language, especially with the long awaited release of Java 7, but also Java 8 profiling in the near future, and Java 9 added to the roadmap. Mobile platforms were also very present, especially the Android platform (whose programming language is Java) and mobile web technologies. Let's also mention the iconoclastic talk from Martijn Verburg, the "Diabolical Developer", full of refreshing behavioral (anti-)patterns for the developer. This year was also marked by the return of the presence of Sogeti. More than 10 consultants attended the conference, but also Sogeti was a Medium partner of the event and had a nice stand in front of the Google one. This was made possible thanks to a collaboration between Sogeti France, Netherlands, and Belux. Kudos for all the people who spent their time answering questions at the stand! And, last but not least, Laurent Guerin from Sogeti France made a well attended presentation about the Telosys web framework. I've already been several times confronted with the task of explaining what Rich Internet Applications (RIA) are, and why they are different from classical web applications. This is the reason why I wrote this article. It is not meant to be exhaustive and it might contain some approximations but I hope it can help the reader to get an insight and build his own idea. « A RIA is a web-based application that is designed to provide functionality similar to a desktop applications. Some RIAs run completely inside a web browser while others are browser-independent. »  This definition implies, notably, that just adding a few AJAX interactions to web pages is not sufficient to turn these pages into an RIA. Sometimes authors insist on this difference by distinguishing "thick RIA" from "light RIA". Though, in our understanding, an RIA is always of the "thick" kind and we won't consider "light" RIA as true RIA. Note that there is a controversy in the literature on the usage of the term RIA. For some, like Gartner, RIA designate only applications running independently from the browser (like Java VM, Flex, or Silverlight). For others, like Kristen Waters, the term RIA also covers applications running inside the browser. In this article we target all cases and, to avoid confusion, we will use the broader expression "rich web applications" (or RWA). As already said, one can distinguish two kinds of rich web applications. Those based on a framework running in a specific virtual machine (like Java VM, Flex, or Silverlight) on one hand, and those using the browser itself as a virtual machine on the other hand. But there are also plenty of vendor specific frameworks, usually little known and used mainly in enterprise environments, like for example General Interface (from TIBCO). Though, most developers available on the market would likely not know these vendor specific frameworks. Frameworks using a specific virtual machine have the disadvantage of requiring a specific prior install, typical in the form of a browser plug-in. (Though this inconvenient is insignificant in the case of Flex, since the Flash Player is deployed in 96% of internet enabled desktops. For Java the figure is 79% and for Silverlight, 61%. ) Advantages are better performances and even richer experience. When it comes to start developing apps for mobile devices, a difficult question is immediately raised: which platform should we select? Indeed, the mobile landscape is the scene a fierce fight between major players (like Microsoft, RIM, Apple, and Google) or challengers (like HP and Nokia). Each of these platforms comes with its own way of developing apps; they often use different languages and SDKs, and always have different APIs. There is obviously no unique answer to the question. It depends on a lot of factors. The way you interpret those factors depends on your intent. Are you an individual who wants to invest time on its spare time to build skills in a new technology? Are you a software architect who must make a technical choice for a specific project? Are you an enterprise that must set architecture principles impacting all developments for the coming years? An individual will take into account its personal taste; the software architect will consider the specific requirements of the project; while an enterprise will have more strategic considerations. There are factors that are typical when you make a technology choice, like cost, performance, availability of technical resources (it might be easier to find Java developers than Objective-C developers), integration with the existing architecture, etc. These bring additional constraints you have to take into account when choosing a technology. When it comes to make a decision there are two main tracks you can take, either you go for native development, or you go for web based development. Each track comes with its own advantages and drawbacks, but the gap becomes smaller, especially since the raise of HTML5 techniques opens the door to web apps that can compete with native ones. Advantages of native development (and drawbacks of web development) are: integration with device services and hardware (though some services might be available through HTML5, like location); and best performances. Advantages of web development (and drawbacks of native development) are: only one set of skills to address all platforms (no fragmentation: pretty much all mobile platforms now (will) support HTML5), re-use of existing enterprise connectivity infrastructure, no overload of device apps collection. So, it will depend on the kind of requirements your application will have. You will choose the native track for: games, access to device features, high performance, rich graphics, single platform target, and – in some cases – off-line mode. You will choose the web track for everything else, especially if supporting multiple platforms or enterprise connectivity is important. Since very recently, a third way is taking shape in the form of the Adobe Flex SDK. It provides a common stack for all platforms. 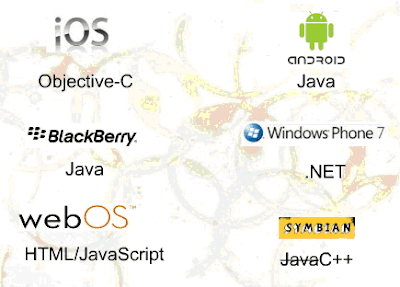 Three alternatives can be chosen for the distribution: either Flash web applications, similar if not identical to applications running on personal computers; or Flash applications deployed locally; or by cross-compiling to a native app. Note however that, for iOS, only the latter is possible, due to Apple boycott of Flash. Mobile applications based on Flex might gather the advantages of both native and web based development, but this technology is very recent in the mobile landscape, and not yet finalized for all platforms. Future will tell us if it’s a viable alternative.